I have always been pretty ambidextrous and there are some things that I favour my left hand with, like playing hockey, archery, pouring drinks! I don't really think about it, it just seems more natural with some things. I don't wear a watch these days but when I did I wear it on my right wrist and strangely enough, Ebi-kun does the same. So, a little story, when I was 16 I left school and went to the local art college for a year, wasn't the best year. Firstly I had applied to do art and tech drawing but when I rocked up, the tech course was mysteriously full - we learned later they had let three lads onto the course under late enrollment. That is a rant for another day. A few weeks into term, our dog managed to knock me down the stairs, I hit my elbow pretty badly and couldn't straighten my arm properly for about 3 weeks, I rocked up to college with my right arm in a sling! The lecturers wanted to know why I had bothered turning up, I said, I'd use my left hand, which I did. I favour my right for writing and drawing but forcing me to use my left was great. Strangely though, my style is completely different with my left hand, one of my lectures actually said that I should use my left all the time! The cheek! Later in the year I broke my leg skiing! Nasty break and missed a lot of college, I did take my mock exams and was allowed to take my A Level a year early, it was surprising they let me because I didn't have that much work in my portfolio due to missing so much college and only being there for a year anyway, and I had missed a lot of classes. Turned out to be a good call on their part as I rocked a B! 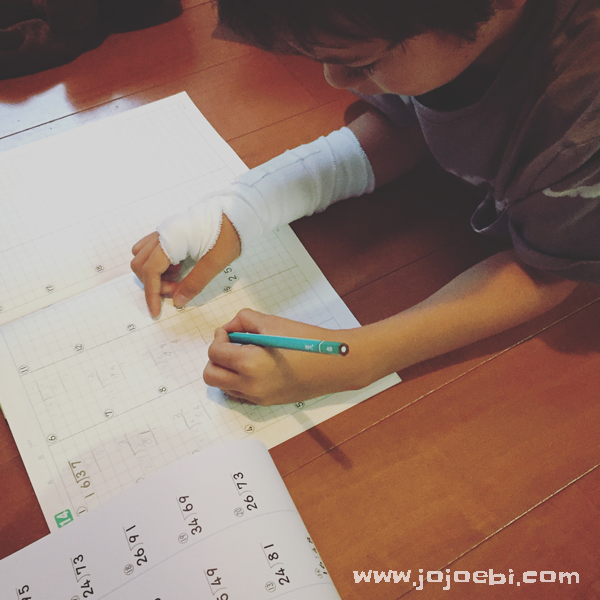 Anyway, Ebi-kun has been going through a similar experience with his fractured arm. Sensei hasn't been very sympathetic and still makes him do his tests! Maths he is doing OK at, he had a set of questions the other day and still finished 4th, doing it with his left hand. Kanji on the other hand he is struggling with because there are so many strokes and it's difficult for him to write them accurately with his left. We see the doctor again today, if still hurts so I'm not sure what will happen. It's sports festival on Saturday so Ebi-kun really wants it fixed by then!